"Reduce, reuse, recycle" is the catchphrase of conservationism and also happens to be the way Earth works as well. Nothing on Earth's surface goes to waste: it all gets recycled—even rocks. Wind, rain, ice, sunlight and gravity wear on the surface of a rock and break it into small pieces called fragments. The fragments are eroded and deposited elsewhere and eventually become what is known as sedimentary rock. Unlike igneous and metamorphic rock, all types of sedimentary rock form without extreme heat or pressure. Sedimentary rock is divided into more specific categories by the way it forms. Clastic sedimentary rock forms when rock fragments are cemented together by other minerals. Organic sedimentary rock forms from the remains of plants and animals. Chemical sedimentary rock forms when dissolved minerals crystallize out of a solution. The defining feature of all types of sedimentary rock is its strata, or layers. Evaporites are the most common class of chemical sedimentary rock. They form from solutions of water and minerals, including sodium, calcium and chlorine. Evaporites appear in areas such as the desert, where evaporation exceeds precipitation. 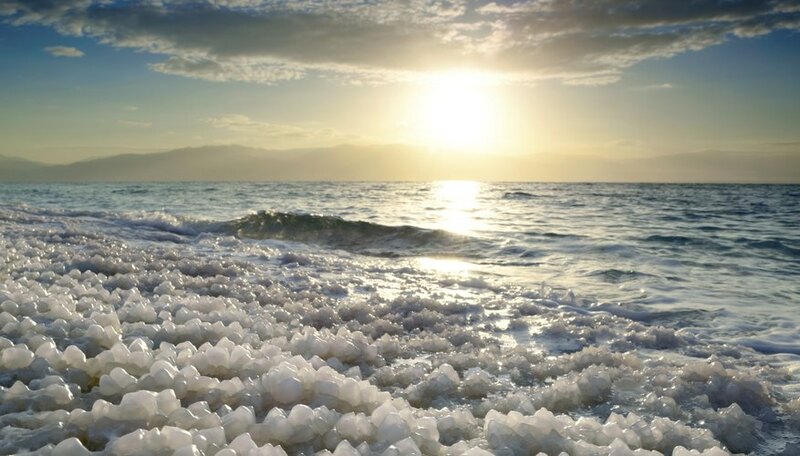 Minerals become concentrated in warm, shallow waters and crystallize as the water evaporates. Evaporites are usually light in color and include halite and gypsum. Mineral structures known as stalagmites and stalactites are a type of chemical sedimentary rock called travertine or limestone. Stalagmites and stalactites form when groundwater saturated with calcium and carbonate ions drips through the ceilings of caves. Very slowly, the mineral ions crystallize, creating elongated mineral formations. Other travertine structures include terraces, ledges and drapes that form at hot springs and along stream banks. If you make a trip to Yellowstone National Park, you'll see exquisite travertine terraces. A chemical sedimentary rock called tufa forms where spring vents enter lakes. Mineral ions, including calcium and carbonate, precipitate immediately, resulting in alien-looking, cauliflower-shaped rock formations. Because precipitation occurs so rapidly, tufa is fairly porous. Tufa structures are so bizarre they are often featured in science-fiction movies. The Trona Pinnacles in the Mojave Desert appeared in Planet of the Apes and Star Trek. You can see evaporation and precipitation at work in a small-scale experiment in your kitchen. Stir a heaping spoonful of salt into a glass of hot water until the salt crystals dissolve completely. Put the glass next to a window for several days, and the water will evaporate, leaving behind salt crystals. Table salt comes from the chemical sedimentary rock halite. Robbins, Carolyn. "How Do Chemical Sedimentary Rocks Form?" Sciencing, https://sciencing.com/chemical-sedimentary-rocks-form-4597600.html. 24 April 2017.